1. Put the rice vinegar and sugar in a small saucepan over a medium heat and stir until the sugar has dissolved. Set aside to cool. 2. Meanwhile, place a large non-stick frying pan over a high heat. Add the cashews and toast for 1-2 minutes until fragrant, stirring constantly. Remove from the heat and roughly chop. 3. 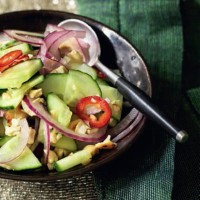 Put the red onion, cucumber and chilli in a bowl and pour over the sweetened vinegar. Stir in the cashews and serve with the curry. This recipe was first published in Tue Dec 13 09:54:00 GMT 2011.